Lately, a feeling of dread consumes my entire self when we approach an unfamiliar marina. Must we go in? Isn’t there an anchorage nearby? We don’t really need anything, do we? Getting right down to it, it’s not the docking that proves difficult. Brian has docked Detour thousands of times. Heck, I’ve even docked at a few shoreline stake-outs and pontoons during our French canal days. In the Netherlands, even rafting to other boats became commonplace whether it was in the marina or while waiting for a lock or a bridge. 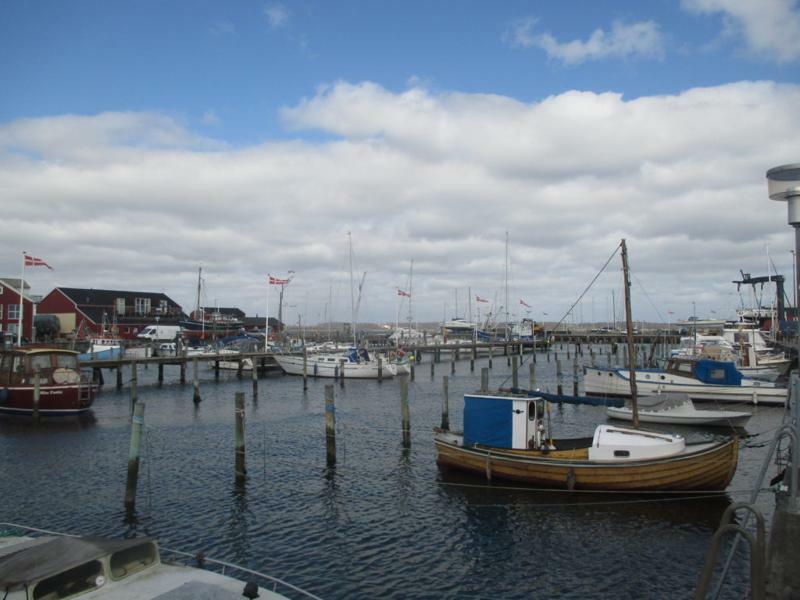 We’d thought we’d seen our fair share of marinas, docks, walls, shorelines, raft-ups…and then we arrived in Denmark. The layout of the marinas is similar to that of a pinball machine. The marina designers must have been competing to see who could build a marina with the most twists, turns, and variety of non-90-degree angles tucked behind sturdy breakwaters. Neat rows of docks and slips no longer exist. After a few glorious days at anchor we were soon hit with the realization that as we progressed farther up the Jutland coast there would be fewer anchoring possibilities and marinas would become necessary. Yikes! 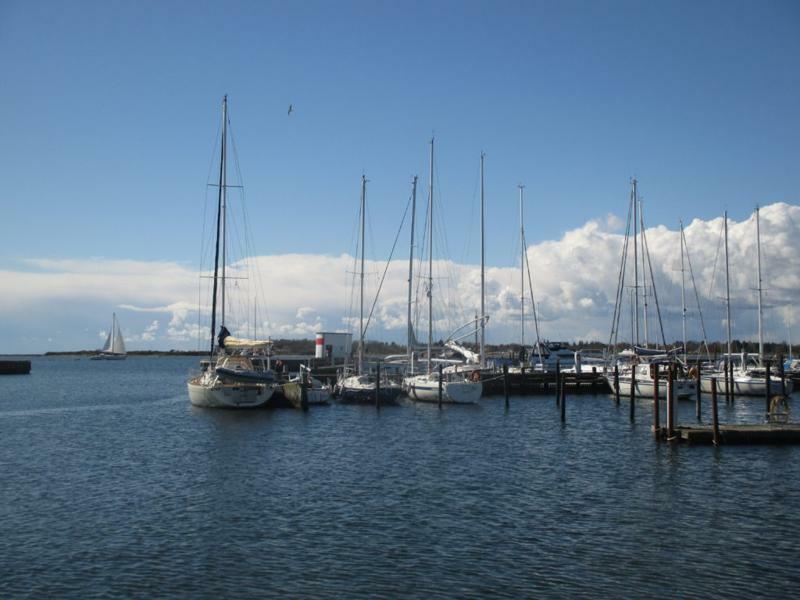 The marinas are scouted as carefully as possible. First, the guidebook description from Cruising Guide to Germany and Denmark by Brian Navin, which happens to have earned the new title here as The Utterly Terrible yet Only Guidebook We Possess for this Section of Our Trip is read hundreds of times. Two sentences that detail only the approach as if passing between two navigational buoys is challenging, yet says nothing about the three choices of direction after entering the marina’s breakwater or which aisle of pillars will dead-end in a too narrow for turn around space. Next, the aerial photographs of the marina provided in last year’s copy of Denmark’s Sijlerens Marina Guide 2015 are imprinted onto our brains. These photographs are compared to those in The Utterly Terrible yet Only Guidebook… to confirm that several docks are out of place and breakwaters have been added. So our photographic memories aren’t exactly sure what will differ this year as we enter the marina. Further marina details from Sijlerens cannot be deciphered by us from the Danish or German languages in which the magazine was printed. However we have decoded the symbols indicating whether diesel, wifi, showers, etc. are available at the marinas. We are eternally grateful for last year’s Danish/German guide, if only for the aerial photos. 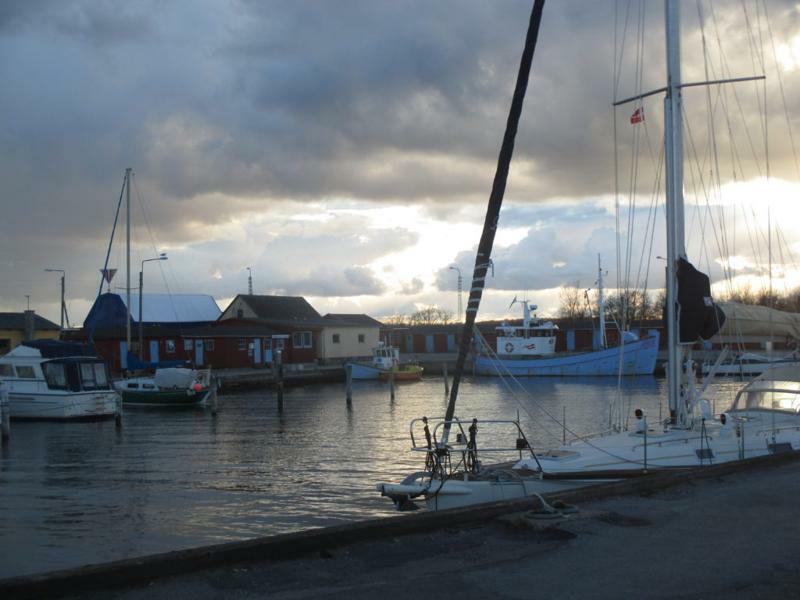 The symbols seem accurate, but many amenities are not yet available since the sailing season has not yet begun in Denmark. The 2016 guide, which will be printed also in English, won’t hit marina clubhouse shelves until May 15th. Rest assured, the automatic teller machines are in full working order, whether or not the bathrooms are unlocked, and this year’s fees have already been raised 10%. The scouted marina should be sheltered from the predicted wind; and by sheltered we don’t intend to be pinned to the dock by the wind for extra holding power, we’d actually hoped to be sheltered from the wind by the neat rows of breakwater rocks. The scouted marina should ideally provide a dock, a wall, or end-pier specifically onto which we can dock. The wall is essential. Finding the wall in the aerial photograph, and not the wall used for fueling if diesel is available, is a must. Why? The alternative requires slipping in-between pillars by way of a technique that remains daunting to us, given a few painfully unsuccessful trials. Finally, we double check the charts and guidebook for any remote possibility of an anchorage. 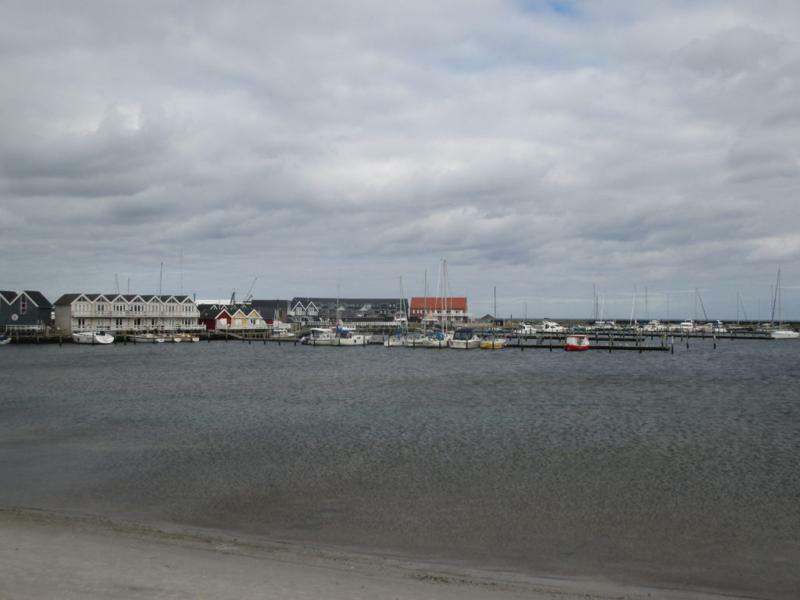 The marinas in Denmark seem massive. Many host berths for 200 or more boats. But scouter beware, sometimes these 200 or more berths are sized for boats under 12-meters. We have a vague idea but until actually entering the marina we aren’t totally positive whether Detour will be a normal sized boat or suddenly transformed into a “big ship.” The berths are created between rows and rows of pillars. The pillars make for cramming lots of boats without the wasteful space of docks. Great concept! Between the pillars mounted on the dock at the head of the berth are small, square, color coded cards to indicate whether the berth is available. A green card indicates the berth is unoccupied. A red card indicates the berth is occupied, not ok for a visitor because at some unknown time the occupying boat will return. Of course, these cards are difficult to see until you’ve passed the berth in which you intend to dock. In theory, you just pull straight into or back straight into the space between the pillars. Bear in mind, however, that whether driving forward or backing in reverse the boat will never enter straight between the pillars. The bow will inevitably swing this way or that and render it impossible to regain control. Unless, of course, you drive at the fastest possible docking speed (let’s say wind in your hair fast) and throw a hard forward or reverse, depending, just prior to slamming the bow or stern into the dock at the head of the berth. At fastest possible speed (obtained from a curious questioning I gave a captain after watching him dock flawlessly this way) there is no worry about actually slamming into the dock at the head of the berth because, “..ah, you just have a fender ready…” which the ever faithful Miss Deckhand is holding over the lifeline and praying that she slides it quickly enough between the boat and any fast approaching hard objects. No recommendation was given as to how to lasso the pillars while simultaneously speeding through and actively fending. There is no indication of the width of the clearance space between pillars, or the length of the spread between the pillars and the dock. Denmark could learn a lesson from Elizabeth City, North Carolina that this information would be tremendously helpful! We have often done a slow drive-by eyeing the berth, “It doesn’t look wide enough but I’m sure it must be.” The eyeing-up technique did not work when we squeezed, backing, between two pillars that were NOT wide enough. I was skipping back and forth across the deck pushing the pillars to wiggle Detour through at her broadest beam section, until Detour was finally wedged into place between the pillars and all that could be done was to drive out again pillar pushing all the way. As it turned out, being wedged gave us plenty of time to secure all the dock lines. The eyeing-up technique did not work when we pulled into a berth plenty wide, but plenty long too once we’d run out of stern dock lines and were not able to reach the dock at the bow to secure the bow. We had to back ourselves out while the bow weaved and wove back and forth crossing into the neighboring berths. (No neighboring boats beside, just a few onlookers, thank you off-season for that embarrassing practice session.) As far as we can determine, pillars can only be entered during ideal weather conditions which never exist such as simultaneous lack of wind and current. Also, there should never be neighboring boats beside the intended berth because the bow will swing wherever it wants while Brian is lassoing and I’m fending. Any hint of a cross breeze, I don’t care if there is a hurricane coming, pillars are not an option! Pillars are terrifying! I hope Norway is more inviting! Less than 5 weeks till I join you in Bergen! Hi Stephanie and Brian it is Alexandra and Michele we love reading about all your adventures and the pictures are great.Someday we hope to get together and have more fun like the last time we all got together.Keep safe ,have fun and keep on keeping on.Love Ya ? Hi Michele & Alexandra, it’s wonderful to hear from you gals! Hope you are both well. Brian and I are spectacular, really enjoying our new playground in Norway! Sending you both lots of love ?⛵️? When are you going to be in PA again ?Alexandra and I will be together next Tuesday May17 maybe we can text then.I am glad to hear everything is great.? ?